Mirror, mirror on the wall, who has the best eyesight of them all? I am following a female cheetah which is hunting in Kenya's Masai Mara. Suddenly she elevates onto a termite mound and then starts to run, not at full pace but at a quick pace. We follow in our film cars for about 1km and come on a newly born Thompson's gazelle fawn lying in the grass. The cheetah walks back and forth and almost steps on the fawn before finding it. After playing "cat 'n mouse" with the fawn, the cheetah carries it into the shade and eats it. Later I return with Elmon Mhlongo a shangaan tracker and Lakakan Sukuli, a Masai, to the place where the cheetah began her run. I place a dummy fawn in the grass where the gazelle fawn was hiding and challenge Elmon and Lakakan to see it. None of them are able to see the dummy. After giving Elmon and Lakakan a set of 8 ply binoculars, they could see, at a distance of 1kilometer, the dummy in the grass. It is certain that the cheetah saw the flick of the fawn's ear and then ran closer to locate the fawn. As long as the prey remain motionless, they can avoid the predator, but the slightest movement will be detected. I have seen cheetah walk within feet of a steenbuck frozen in the grass and I have seen leopard walk within 10 feet of a grey duiker motionless in the bush. At Londolozi Game Reserve, I am watching a leopard cub playing in tree. 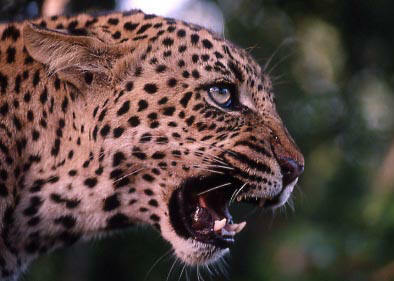 Suddenly the leopard descends the tree and runs 300 metres to a dead leadwood. On the leadwood is a large monitor lizard, perfectly camouflaged against the bark of the tree. The leopard cub attacks the monitor lizard which falls to the ground. Here the monitor lizard shams dead for a full 15 minutes as the leopard cub rolls and claws it. The monitor decides on another form of defense. It bites the leopard cub on the foot. The monitor's jaws clamp in a vice like grip and the leopard cub is unable to free itself for a full 40 minutes. There is no doubt that the initial movement of the monitor lizard attracted the leopard to it from a distance of 300m. I am rehabilitating the lioness Shingalana from a tented camp on the edge of a dry river bed at Londolozi Game Reserve. At 10pm I hear the distress call of a duiker. Shingalana has caught, but not killed a grey duiker in the dry river bed. Taking a rifle, I leave my tent to investigate, but can see nothing in the darkness. I wait several minutes to allow my eyes to adjust to the dark, but although I can hear the duiker giving the distress call, I can see nothing. There is no moon and heavy clouds obliterate the starlight. It is the blackest of nights. So how did Shingalana see the duiker, let alone catch it in the darkness? The reference books will tell you that a lions night vision is 6 to 7 times better that a human being's. How as a matter if interest, did the scientists discover that? The white stripes under the lion's eyes reflect the star and moonlight into the heavily rodded eyes of the lioness. Wanting to assist Shingalana with her kill, I take a paraffin lantern a move to Shingalana's position. What is obvious is that her iris completely fills her eye. Like the lens of a camera, it is wide open in the low light. Shingalana's eyes are rodded and possess a tapetum lucidum which absorbs the available light. On this night, there is no light, no moon, no stars nothing! Did she perhaps use the whiskers which act as sensory organs in the dark, to locate and catch the duiker, I doubt it. Later I conducted an experiment on a dark night. 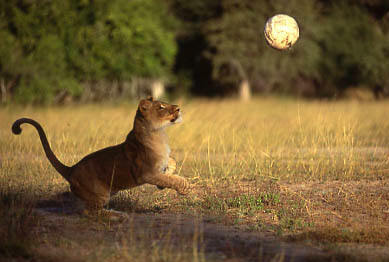 I threw Shingalama a soccer ball which was illuminated by a spotlight, she caught it easily. Then I threw her a soccer ball on a night with no moon, just starlight, she caught the soccer ball easily. The Tigers at Tiger Canyons are most successful when hunting during electrical thunderstorms, (when the prey's senses are dulled), or on very dark nights, when darkness allows them to stalk or ambush the prey. They will not normally hunt when there is a full moon. The cheetah on the other hand, will mostly hunt during the day but will also hunt on a full moon when visibility is good. 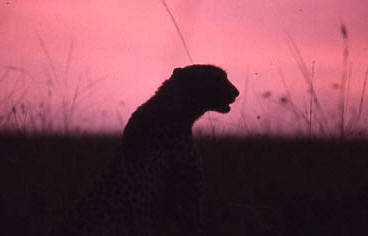 The cheetah's night vision is the poorest of the big cats. They will hunt on moonlight nights. So which cats have the best eyesight? For the best long vision during the day, I'm going for the cheetah, with lion as the second best. For the best night vision I'm going for the individual stalker pouncers, leopard and tiger. I cant split these two. The second best cat for night vision, I'm going for lion. I'm wondering if lions will hunt on a truly dark night. Being a co operative hunter they would need to know where the other hunters are, so some starlight maybe necessary. Too much moon and the prey can detect them. Therefore a dark night for lion with some starlight maybe ideal. In terms of night vision I put the cheetah last of the four big cats. 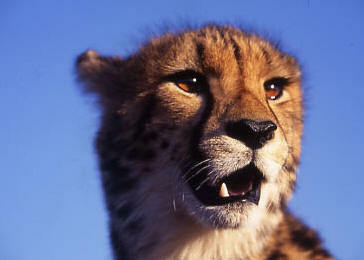 The cheetah's whiskers are small, the tear line is designed to cut down glare in the day. The small white lines in the inside of the eye and tapetum lucidum gives night vision because they need to detect approaching danger on a dark night. All cats I believe detect the movement first and then move closer to get the definition of the prey. This is why nyala, bushbuck mountain reedbuck, kudu, grey duiker amongst others, will all use the freeze technique to avoid the predator. Therefore long vision in the daytime, cheetah first, lion second. Night vision, tiger and leopard first, lion second, cheetah third. Please send me any information on vision of big cats and thank you for all your feedback on "Who is the Fastest of them All"
Why do different species of cats have different pupils? All big cats and some small cats (cougars and lynx) have round pupils. But all house cats and the species they descend from (caracals, African sand cats, etc.) have vertical, almond-shaped pupils. By day, the circular pupil is inefficient at blocking light. Pupil shapes have evolved that limit incoming light, the most advanced being the vertical slit. The slit pupil can shut out all light except a narrow band. Its vertical orientation is of significance too, as it works well with eyelids. As an animal squints, partially closing its lids at right angles to the vertical slit pupil, it further reduces the amount of light entering its eye. 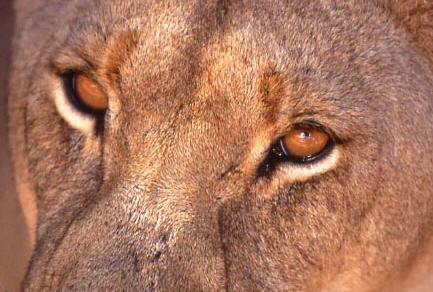 Lions hunt by day and have circular pupils, while smaller cats hunt by night and have slit-like pupils. Their vertical pupils help them to endure the bright daylight by restricting the amount of light that penetrates the lens. Lions are less concerned with this and spend much of their time asleep. The pupil of the clouded leopard never gets fully round like those of big cats, but never shrink to vertical slits . 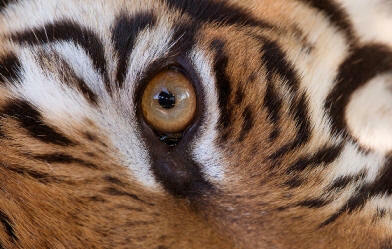 The Tiger and cheetah has round pupils although the tiger hunts at night.